The phone rings. It's my husband eager to tell me he has just bought a new car. For many women, this would be a moment of some excitement, of some anticipation. But I have to admit my heart sinks. Not for us the mid-life crisis convertible or the ubiquitous 4x4. Oh no. The car causing all the excitement (his, not mine) is an £800, 13-year-old Rover Ascot 100. Never heard of it? Neither had I, but Tom fills me in. It's a version of the Mini Metro and this one has only had one female owner. 'What a bargain!' He declares. Later that afternoon, Tom arrives home in said vehicle. A car to make Noddy's wheels look macho. Ugly doesn't even begin to describe it, with its metallic green finish and velour seats. And it's anything but a pleasure to drive. Of course, Tom shrugs his shoulders when i point out all of the above. instead, he congratulates himself on the money he has saved and walks off to study the logbook, which he discovers has been fastidiously completed. Now, I don't want to sound ungrateful. And I'm well aware that my husband has the higher moral ground: who really needs a car that costs more than the national average salary? But at times like this I can't help wondering whether his financial prudence is really to be admired (this is our second car after all). Or whether he is just a miserable old skinflint. Either way, much as I admire my husband's determination to ignore the testosterone-fuelled one-up-manship of motor vehicle ownership, it's still embarrassing to rock up at the school run and park alongside the pristine Land Rovers, BMWs and Mercs. I should have known life with Tom would turn out this way. Own up! Which HPCer is Tom Rawstorne? The first time I met his father, he was seated in the drawing room of his Somerset pile in a winter coat and hat. It was early March and the heating had been off for more than a month. My first Christmas at the in-laws was also telling. The festivities included passing round a box of dates from the Co-op and the presents, all immaculately wrapped in recycled paper, were a bar of soap or a pair of socks. His mother delights in a family tradition whereby she and her two other siblings ritualistically exchange a £10 note in lieu of a gift. Another role model is my husband's best friend from school. He had his house re-floored with office grade carpet tiles and his cutlery draw contains four knives, four forks and four spoons to cut down on washing up and to rule out dinner parties. 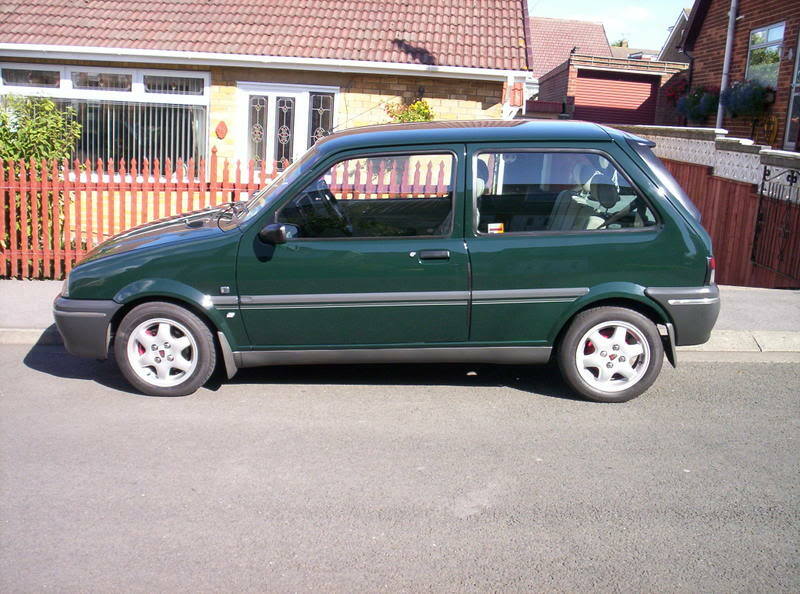 Sorry, £800 for a 13 year old metro is not a bargain. Even if scrappage has taken all the nails off the road he should have spent money on something newer. I walk instead and tie scrap cardboard to my shoes to save the soles from wearing out. The horse reminds me of my Grandfather's stories about having his shoes resoled using leather sourced from old saddles. Apparently they were a good source of leather as the sweat from the horse had permeated the leather and made it stronger. The guy at the local market used to repair all their shoes in this way. Nothing of the sort Frank, I paid a lot more for my car. I was just saying that if I was looking for a cheap car I wouldn't spend £800 on a metro. £400 tops or more than £800 on something newer and to be honest much much better. I never understand this 'must be seen to be well off' caper. I understand having a nice, neat place to live but the rest of it balderdash. The cheaper you can do normal things for, the less the stress. "He bought my eldest daughter a ball of string for Christmas" - Classic! Sit down for this Mr P. but... I bought it NEW! Cars can be more troublesome than children and frankly I've got better things to do than faff about with garages and pay for car problems which I have had in the past. 4 years old and hoping to make it to double figures. Next time you get strange urges like this you call your sponsor, okay? that was my first car! uncle Olly helped my find it. not really exiting he said but will last you & easy on your pocket, paid @ £300 low milege & 1 elderly owner with full history etc, it lasted me years, if it wasn't for mates borrowing it & trying hand brake turns in local Tesco's it would've lasted even more! Turning up in an expensive car to `keep up with the Joneses?` Just wait until the Joneses cannot keep up in the possessions arms race and find themselves sinking under a mountain of escalating debt. I think you'll find that the Joneses just enjoy the high life until the time comes for the default / bailout and start all over again as the Smiths. While you wallow in skintness next door. Most of the things he does sound pretty reasonable to me and make me happier than buying lots of shiny things. Shame I can't find a lady with these attributes. Sounds like Tom is going to be living happily when everyone else is skint and blaming the credit card companies and / or government. Good for him. For complete happiness he just needs a wife who isn't superficial and greedy. I have to add I’m a hypocrite though as I want an attractive misses so it is only natural she will want someone who splashes the cash. What she doesn't realize is the chap is trying to set up a stable future for all of them. "I know my consumerism drives him mad and makes him even more determined to make savings. And if he didn't play Scrooge, we wouldn't live the life we do. Besides, I am growing rather fond of his monastic ways." Sounds like perhaps she does understand. There would not be an article to write if she did not present it from the "consumerist-bubblehead-wife" point of view. In any case, I am happy that this appears in the mainstream press. Bit of a contrast from all the WAG-ish shopping articles or that stupid dimwit woman who spends too much, Liz Jones or something. Another is that the Joneses start getting flooded with demands for repayments, an adverse credit rating for six years, court orders, bailiffs and possible repossession of their home. And? There have been other threads here linking to articles where people don't pay the liarmortgage / rent for months before finally getting turfed. They then get rehoused free of charge. All you need is 4 screaming kids and you're sorted.